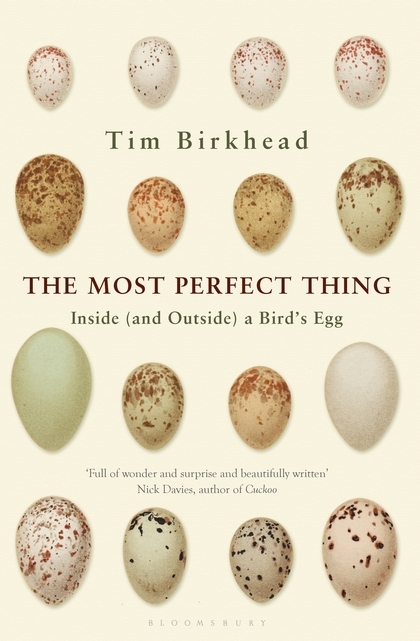 Sir David Attenborough wrote in the latest edition of BBC Wildlife magazine that Tim's new book on birds' eggs, called The Most Perfect Thing, featured some magnificent science - but it was written in a completely accessible way for the general reader. And, indeed, this proved to be case with Tim's talk on December 2nd when he led us through the wonders of birds' eggs in all their amazing forms. Collecting eggs has been illegal in this country since 1954 but Tim, a Fellow of the Royal Society, showed us footage from the 1930s of the climmers (Yorkshire for climbers) who abseiled down the cliffs at Bempton, near Bridlington, to try and collect the eggs of thousands of birds such as guillemots, razor-bills and puffins nesting on the cliff-ledges. Watching the climmers at one stage was George Lupton, a Lancashire lawyer who also collected birds' eggs - and was often on the look-out for a specimen called the "Metland egg", named after a local farm at Bempton. It was reddish brown and had been taken each year from the same spot, just a few inches square, for over 20 years consecutively. Once an egg is taken, the female guillemot will lay an almost identical egg in exactly the same spot - and, indeed, they will lay a third and a fourth - which means that the "Metland female" has never succeeded in rearing a chick because the climmers farmed the eggs on an almost industrial scale. At first, Tim told us, the eggs were used for human consumption and as many as 100,000 may have been taken each year in the 1920s and 30s, although many others were sold to collectors. Collecting birds eggs in the 1800s had become a national passion and had much in common with collecting butterflies - driven partly by aesthetics but also by the idea of capturing the full range of variation existing within a particular species. And collecting eggs, said Tim, was seen as an essential part of the study of natural history - and well-known naturalists, such as David Attenborough and Bill Oddie have admitted to collecting eggs when young. Tim has been studying guillemots for forty years and told us their eggs are extraordinary because of their size, colour and pattern. 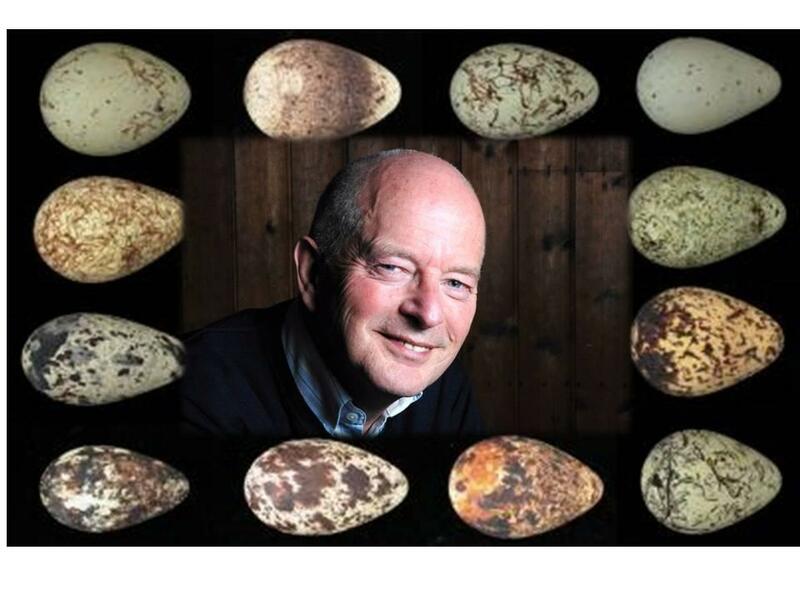 And it was this seemingly infinite variety that also appealed to George Lupton and fellow collectors - his collection comprising over 1,000 unusual guillemot eggs was probably the world's best, although he had sold the collection a decade before the 1954 Protection of Birds Act made it illegal to keep them. Tim also told us about Francis Willughby, who published an early book on birds in 1676 and who kept his collection in a cabinet which had survived as part of the family estate - and how one day Tim was given access to it, containing specimens 350 years old (possibly the world's oldest collection), all neatly labelled which was, indeed, a rarity. Tim also took us through the astonishing process involved in the creation of a bird's egg and it being laid - comprising a structure that keeps microbial aliens out, but at the same time allows the embryo inside to breathe; a shell that is strong enough to withstand the full weight of an incubating parent, but also weak enough to allow a chick to eventually break free. Evolution, he said, had done a fine job in devising a self-contained life support system. He described how the egg arrives at the uterus just before the shell is created and about six hours after it was released from the ovary and fertilised. On entering the uterus, the egg is bound by a soft membrane which is squidgy to the touch - a yolk surrounded by a very viscous albumen contained and supported within an egg-shaped bag - the shell membrane - which is composed mainly of protein mixed with a bit of collagen. Then, Tim added, a series of different "aerosol sprays" have different functions, including some with a form of crystalline calcium carbonate which permits the creation of a hardened shell. In the final hours of the egg's creation, another set of sprays start squirting coloured dyes and the pigment mixes with the last layer of calcium carbonate to create the ground colour of the egg surface. Once this ground-colour is complete, another set of "paint guns" create the spots and streaks. Tim then moved on to the remarkable range in the shape of birds' eggs. Owls typically lay spherical shapes; the hummingbird is oval or elliptical; whilst the Slavonian grebe is bi-conical. 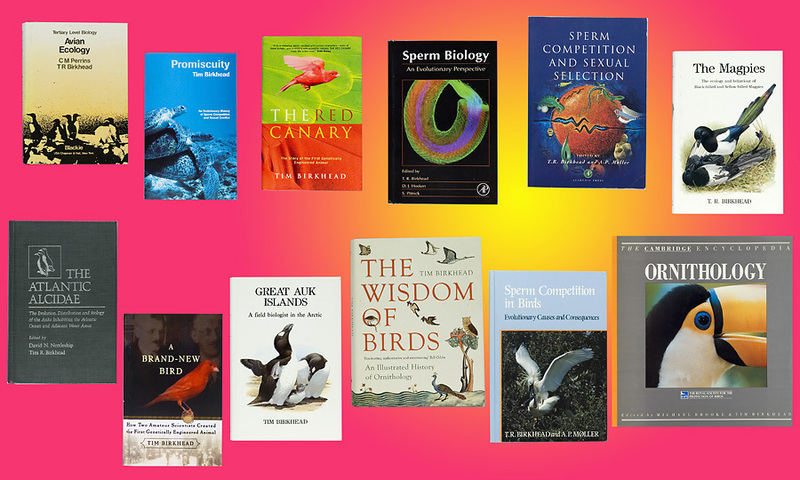 However, the guillemot's egg has a more extreme design than almost any other bird, being shaped like a pear, with the received wisdom (later thought incorrect) that the shape evolved to prevent the egg from rolling away on a steep cliff-ledge. However, Tim told us that, at first, he had thought the shape was determined by the shell, with both being created together. but the truth is much more bizarre with the contours of an egg governed by its membrane, the parchment-like thin layer inside the shell - rather than the shell itself. 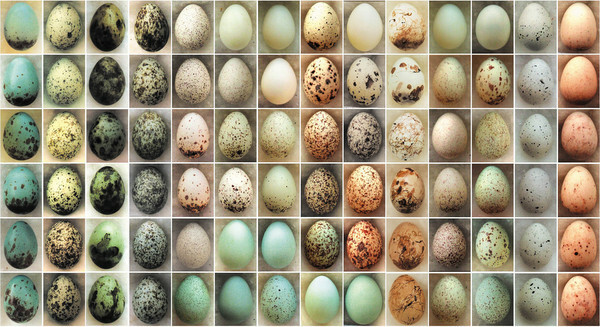 Different shapes of eggs may also be how birds produce eggs of a specific volume - so, if the diameter of a bird's egg is constrained, then the one way to pack more into an egg is to produce longer, thinner eggs. In general, added Tim, smaller birds lay relatively large eggs, even though in absolute terms their eggs are tiny. The goldcrest weighs five grams but its eggs weigh 16pc of its body weight., whilst the European storm petrol is even more extreme, with the egg weighing 24pc of the female's body weight - the equivalent of a human baby weighing 30 pounds, with the difference being that in birds, the pelvis is "incomplete" and doesn't form a circle of bone, as is the case with mammals. Tim then took us through the process of colouring on an egg. Historically, several researchers had thought that the colour on eggshell was an accidental by-product of the egg-laying process caused, for example, due to the leakage of blood through the walls of the uterus or the contamination of the bile-pigments. 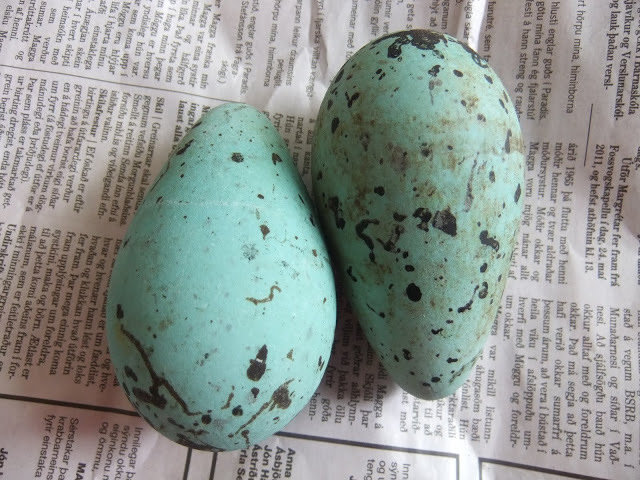 But Tim told us that he had wanted to find out why owls' eggs are white; the guillemots are so variable in colour; why thrushes' eggs are blue and why the eggs of some tinamous are a startling grass-green, like glazed porcelain. Ground-nesting birds, like plovers, terns and waders produce camouflaged eggs to blend into the background But he admitted we are still in the dark as to why birds breeding in the dark have spots and streaks on their eggs. Theories on brightly coloured eggs relate to the male being coerced into providing more parental care, whereas another theory is that a conspicuous egg colour reflects a female's quality - and the brighter the egg, the more likely the male partner is to invest in that female and her clutch....although Tim admitted that in many areas, the jury is still out. He was heartened to discover that one of the first people to investigate the chemical nature of egg pigments was the Victorian scientist, Henry Sorby - who helped found the University of Sheffield, where Tim has spent most of his career and where he is Professor of Animal Behaviour. Much more recent research has shown that there can be pigment in any or all of the layers that make up the shell and Tim told us the release and production of a pigment are precisely timed - with guillemots alone, there is almost every possible colour and marking found among all 10,000 species of birds. Although millions of pounds have been spent on research into eggshell formation in domestic fowl, Tim said almost nothing had been spent until recently on how marks were made on the shells of other species. It was discovered that with Japanese quail, which produce heavily marked eggs, studies showed that markings are applied in the final three or four hours before laying - whereas with guillemots, where some of the markings lie deeper in the shell, colour can be produced much earlier. With razorbills, the eggs are heavily patterned and, with marks appearing to bleed or blend into one another, Tim suggested the egg may be rotated slightly within the shell gland as the various "paint-guns" are firing, creating an effect similar to smudging wet paint. He also examined an early theory that with a common parasite, like the cuckoo, the female looked at its host's eggs, captured an image in its brain - and then sent the message to the uterus where it was reproduced on the surface of the egg she was about to lay. However, this was disproved when it was later known that the female always produces eggs of the same colour. In Zambia, research showed that whilst the colour of eggs of a host-bird - a prinia - had changed over just a 40-year period, the eggs of the parasitic cuckoo-finch had also changed colour as well. Tim suggested it would be hard to find a better example of a co-evolutionary "arms race" between a host and parasite. 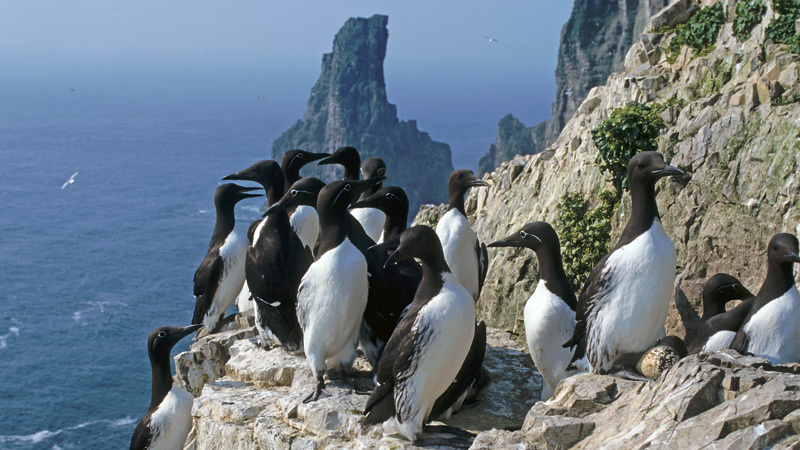 In the UK, experiments showed that guillemots - Tim's great love - were able to learn the colour of their eggs. He added that the study of egg colouration has come a long way and has been boosted by technological innovations, such as digital cameras able to measure and quantify colour more precisely than before. This has prompted what some researchers now call the "renaissance in the study of egg pigmentation", with studies increasing appreciation of the diversity of eggshell colour and pattern - created largely through the use of just two pigments. Nearly 130 people attended Tim's Christmas talk and he sold 33 copies of The Most Perfect Thing to a highly appreciative audience. This year, we welcomed an average audience of 121 - and the Talks Team would like to thank all our speakers for donating their expertise and time to our project as well, of course, everybody who supported the ten Talks this year. We look forward to greeting our supporters in 2017 when we hope the line-up of speakers will prove equally attractive.